Yesterday was do-or-die time! As usual, I have way too many projects going. I have a self-imposed taco recipe creation project. I'm training for a marathon in February. I have a job, and this coming week is crunch-time. (We have a major concert this coming Sunday - not that I'm complaining - I'm lucky to have such an insanely cool job!) Anyway, yeah. Lots of stuff. Over the last few years, I have become disillusioned with the shop-'til-you-drop mentality of Christmas. Along with other members of my family, I have discovered the fun of exchanging homemade Christmas gifts. I still do a bit of shopping (just to say I did it), but lately I've been making most of my Christmas gifts. Though I did start quilting this year (check out this crazy, so-almost-finished project,) the things I do best revolve around food and alcohol. Yep. I've make pickles, beer, peanut brittle, granola, and various other items to give as gifts. I've been brewing off-and-on for about 3 and-a-half years. I am not an expert by any means, but I enjoy it. I've learned a lot over the last few years. For the most part, I've followed recipes. Not this time, though. Creating recipes? Yeah - NBD - have you seen all these tacos??? O.O So, I made up a beer recipe this time. Whatever. Anyway . . . back to do-or-die time! It takes about 4 weeks to make beer from start to finish. That's a minimum - not really ideal. Yesterday, I had three weeks and five days until Christmas. It was my LAST chance to make a Christmas beer. I already got a big fail for my non-existent Thanksgiving beer. I was just too busy! This time, though? 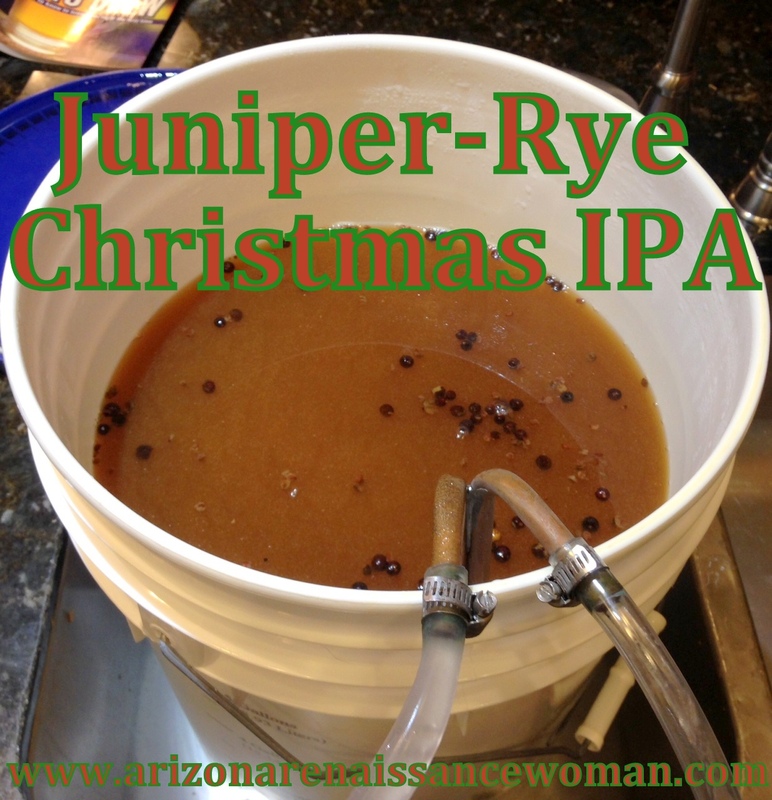 I so wanted a homemade beer to give to my family on Christmas morning! We like IPAs, so I decided to go with mostly pale malt and lots of piney and grapefruity hops. To give it a bit of a holiday flair, I added some crushed juniper berries, spicy rye, and brown sugar. I can see it working out well. Ha ha. This is a bit off-topic, but yesterday was also do-or-die time for the marathon. I missed a couple of long runs over the last few weeks. I knew I had to get in a decent run or throw in the towel. So . . . I ran almost 14 miles and then I brewed this beer. Don't ever do that. No joke! 3. Add the sugar to the wort and do a one-hour boil adding the hops, Irish moss, and juniper berries as indicated. 4. Cool the wort as quickly as possible. I added about 4 bottles (16 oz. each) of cold water to raise the volume to a little over 5 gallons as some of the liquid had boiled off. Here's my setup. Don't laugh! I have a copper wort-chiller, and I siphon ice water through it using my bottling bucket. 5. Pitch the yeast at about 70 degrees. 6. Ferment at 63 to 68 degrees. I'm also going to taste it. If the juniper is not coming through, I may add another 1/2 oz. of crushed juniper berries. We'll see. I'm all for piney flavor, but I don't want it to taste like . . . a gin-soaked pinecone. Hmm. I'm planning to bottle it on Friday, December 11th. That's rushing it, but I think it'll be drinkable on Christmas. I'll chill a 6-pack of it on Christmas Eve so we can all sample it on Christmas Day. Well, I did it. For better or worse. Parents and siblings, if you're reading this, here's part of your Christmas gift. I hope it's tasty. I have high hopes for this brew! Wow. I paid for it this morning. What a Monday. Almost 14 miles. Juniper-hoppy goodness. Sigh. I am so thankful for coffee. It sustains my hopes and dreams.